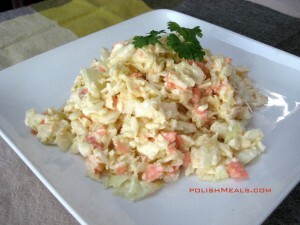 Summer is barbecue time and when it comes to barbecue I think of coleslaw as a side dish along with burger or sausage. But don’t get me wrong – I eat and serve coleslaw all year long with all types of meals. Raw white (also called green) cabbage that is used to prepare coleslaw salad is loaded with vitamin C and some vitamin A, Calcium and Iron. Please don’t be afraid to use the fat (Olive and Mayo) as they help our body better absorb vitamins from this salad. Bon Appetit and stay well. Posted in: Salads, Side Dishes. 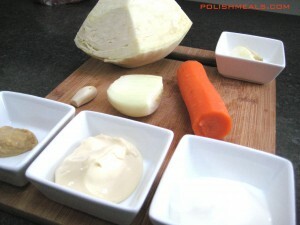 Tags: cabbage, carrot, garlic, mayonnaise, olive oil, onion, sour cream. Made it! So yummy, great for low carb, since it doesn’t have sugar!